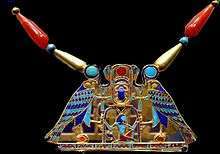 The pectorals of ancient Egypt were a form of jewelry, often represented as a brooch. These were mostly worn by richer people and the pharaoh. One type is attached with a necklace, meant to be suspended from the neck but to lie upon the breast. Statuary from the Old Kingdom onwards shows this form. A later form was attached as a brooch, with the thematic, iconographic function and statement outweighing its actual use as a piece of jewellery for adornment. The thematic statements were typically about the pharaoh or statements of ancient Egyptian mythology and culture. They are usually of gold with cloisonné inlays of gemstones. The many determinatives for pectoral are not portrayed in the Gardiner's Sign List. However, one of the 10 words for 'pectoral', or 'collar' uses the Usekh collar determinative, S11, the "collar necklace"
'None' may have an alternate determinative used to define the word. From the above definitions, it can be seen that the collar, neckband, pectoral, beads, etc., can also include amulets inclusive into the pectoral's iconography. The above listed words are refenced in E. A. Wallis Budge's "dictionary" to 200 works: steles, papyri, Egyptian literature, personal literature, etc., or the approximate 120 authors referenced. Standing statues, or others were sometimes represented with various forms of jewellery, including the pectorals; some are enigmatic in what is being portrayed, whether to gods, or what the symbolism represents. Statements in Egyptian language hieroglyhs were often the theme of famous pectorals, regardless of their actual use for adornment. Lord (of) Heaven, God-Good, Lord of the Two Lands, 'Ny-Maat-Ra', Lord (of all) Lands. Gardiner's Sign List#S. Crowns, Dress, Staves, etc. ↑ Budge, 1978, (1920), p. 1183, "pectoral", Index of English Words. ↑ Budge, 1978, (1920), p. 1183. ↑ Budge, 1978, (1920), Principal Works also used in Preparation of Dictionary, p. lxxvii-(77). ↑ Budge, 1978, (1920), Works also used in Preparation of Dictionary, p. xc-(90). ↑ Lambelet, 1981, Gold pectoral in the form of a chapel inlaid with carnelian, lapis lazuli, and turquoise, p. 228. ↑ Lambelet, 1981, p. 228. ↑ Kamrin, 2004. Ancient Egyptian Hieroglyphs: A Practical Guide, p. 84, p. 216. 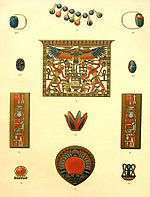 Wikimedia Commons has media related to Ancient Egyptian jewelry. Wikimedia Commons has media related to Ancient Egyptian pectorals.